Claudio Gentile, a Libya-born Italian and renowned football player. Italian settlers in Libya (Italian: Italo-libici, also called Italian Libyans) typically refers to Italians, and their descendants, who resided or were born in Italian Libya, in the colonial period preceding independent Libya. Italian heritage in Libya can be dated back to Ancient Rome, when the Romans controlled and colonized Libya for a period of more than five centuries prior to the fall of the Roman Empire and its takeover by Arab and Turkish civilizations. But predominantly Italian heritage in Libya refers to modern-day Italians. In 1911, the Kingdom of Italy waged war on the Ottoman Empire and captured Libya as a colony. Italian settlers were encouraged to come to Libya and did so from 1911 until the outbreak of World War II. 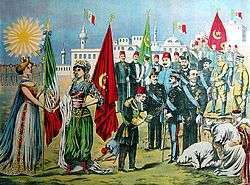 An idealized image of the take over of Ottoman Tripolitania by Italy in 1911. In less than thirty years (1911–1940), the Italians in Libya built a significant amount of public works (roads, railways, buildings, ports, etc.) and the Libyan economy flourished. They even created the Tripoli Grand Prix, an international motor racing event first held in 1925 on a racing circuit outside Tripoli (it lasted until 1940). Italian farmers cultivated lands that had returned to native desert for many centuries, and improved Italian Libya's agriculture to international standards (even with the creation of new farm villages). Catholicism experienced a huge growth in those years, with many new churches built for the growing Italian community: in the late 1920s the two catholic Cathedrals of Tripoli and Benghazi were built. The one in Benghazi was considered the biggest in north Africa. The governor Italo Balbo is attributed with the creation of modern Libya in 1934, when he convinced Italian leader Benito Mussolini to unite the Italian colonies of Tripolitania, Cirenaica and the Fezzan into one single country named "Libia" in Italian. Libya was considered the new "America" for the Italian emigrants in the 1930s, substituting the United States. The Italians in Libya numbered 108,419 (12.37% of the total population) at the time of the 1939 census. They were concentrated in the coast around the city of Tripoli (they constituted 37% of the city's population) and Benghazi (31%). In 1938, Governor Balbo brought 20,000 Italian farmers to colonize Libya, and 26 new villages were founded for them, mainly in Cyrenaica. 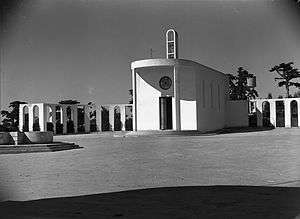 On January 9, 1939, the colony of Libya was incorporated into metropolitan Italy and thereafter considered an integral part of the Italian state. 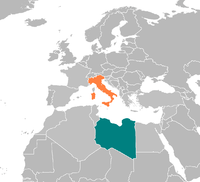 Libya, as the Fourth Shore, was to be part of the Imperial Italy, desired by the Italian irredentists. By 1939 the Libyan Italians had built 400 km of new railroads and 4,000 km of new roads (the largest and most important was the one from Tripoli to Tobruk, on the coast) in Libya. ..."Once pacification had been accomplished, Fascist Italy endeavored to convert Libya into an Italian province to be referred to popularly as Italy's Fourth Shore. 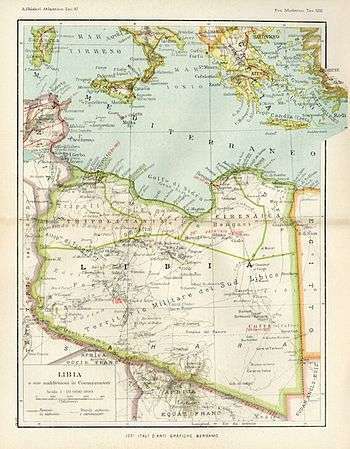 In 1934 Tripolitania and Cyrenaica were divided into four provinces--Tripoli, Misrata, Benghazi, and Darnah--which were formally linked as a single colony known as Italian Libya, thus officially resurrecting the name that Diocletian had applied nearly 1,500 years earlier. Fezzan, designated as South Tripolitania, remained a military territory. A governor general, called the first consul after 1937, was in overall direction of the colony, assisted by the General Consultative Council, on which Arabs were represented. Traditional tribal councils, formerly sanctioned by the Italian administration, were abolished, and all local officials were thereafter appointed by the governor general. Administrative posts at all levels were held by Italians. An accord with Britain and Egypt obtained the transfer of a corner of the Anglo-Egyptian Sudan, known as the Sarra Triangle, to Italian control in 1934. The next year, a French-Italian agreement was negotiated that relocated the 1,000-kilometer border between Libya and Chad southward about 100 kilometers across the Aouzou Strip, but this territorial concession to Italy was never ratified by the French legislature. 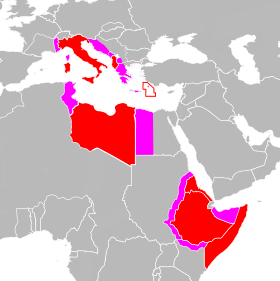 In 1939 Libya was incorporated into metropolitan Italy. During the 1930s, impressive strides were made in improving the country's economic and transportation infrastructure. Italy invested capital and technology in public works projects, extension and modernization of cities, highway and railroad construction, expanded port facilities, and irrigation, but these measures were introduced to benefit the Italian-controlled modern sector of the economy. Italian development policy after World War I had called for capital-intensive "economic colonization" intended to promote the maximum exploitation of the resources available. One of the initial Italian objectives in Libya, however, had been the relief of overpopulation and unemployment in Italy through emigration to the undeveloped colony. With security established, systematic "demographic colonization" was encouraged by Mussolini's government. A project initiated by Libya's governor, Italo Balbo, brought the first 20,000 settlers — the ventimilli — to Libya in a single convoy in October 1938. More settlers followed in 1939, and by 1940 there were approximately 110,000 Italians in Libya, constituting about 12 percent of the total population. Plans envisioned an Italian colony of 500,000 settlers by the 1960s. Libya's best land was allocated to the settlers to be brought under productive cultivation, primarily in olive groves. Settlement was directed by a state corporation, the Libyan Colonization Society, which undertook land reclamation and the building of model villages and offered a grubstake and credit facilities to the settlers it had sponsored. The Italians made modern medical care available for the first time in Libya, improved sanitary conditions in the towns, and undertook to replenish the herds and flocks that had been depleted during the war. But, although Mussolini liked to refer to the Libyans as "Muslim Italians," little more was accomplished that directly improved the living standards of the Arab population. 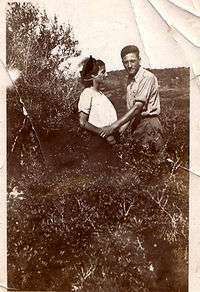 An image showing an Italian colonist couple in Libya. In 1940 World War II broke out between Italy and Great Britain. The defeat of the Axis forces in the North African Campaigns of World War II meant Italy lost Libya to British and French control. After these Western Desert Campaign defeats in 1941, Italy was forced to abandon its colonial intentions and projects. The era of international decolonization fostered an exodus of Italians from Libya, especially after Libya became independent in 1951. After 1970 the Italian population almost disappeared after Libyan president Muammar Gaddafi ordered the expulsion of Italians. Only a few hundred Italians have been allowed to return to Libya in the 2000s (decade). In 2006 the Italian embassy in Tripoli calculated that there were approximately 1,000 original Libyan Italians in Libya, mostly elderly people living in Tripoli and Benghazi. After the National Transitional Council (NTC) has been responsible for the transition of the administration of the governing of Libya in 2011, some Italo-Libyan refugees in Italy who were expelled by Gaddafi returned to Libya. There are also many descendants (probably 10,000, according to estimates of Italian historian Vidali) of Italian settlers who married Arabs and/or Berbers, and Libyans of mixed Italian and Arab/Berber blood may be considered Arabs or Berbers in the Libyan census. At present, the Libyan Italians are organized in the Associazione Italiani Rimpatriati dalla Libia. They struggle to get their confiscated properties. Ottavio Macaione (Born 1925), favorite local football player in Tripoli. ↑ Istat (December 2010). "I censimenti nell'Italia unita I censimenti nell'Italia unita Le fonti di stato della popolazione tra il XIX e il XXI secolo ISTITUTO NAZIONALE DI STATISTICA SOCIETÀ ITALIANA DI DEMOGRAFIA STORICA Le fonti di stato della popolazione tra il XIX e il XXI secolo" (PDF). Annali di Statistica. XII. 2: 269. Retrieved 24 December 2013. ↑ Italo Balbo, called "Father of Libya" in Taylor, Blaine. Fascist Eagle: Italy's Air Marshal Italo Balbo. ↑ Favero, Luigi e Tassello, Graziano. Cent'anni di emigrazione italiana (1876-1976). Cser. Roma, 1978. ↑ In 1938 20,000 Italian colonists settled in coastal Libya. Italian authorities created 26 new agricultural villages for them: Olivetti, Bianchi, Giordani, Micca, Tazzoli, Breviglieri, Marconi, Garabulli, Crispi, Corradini, Garibaldi, Littoriano, Castel Benito, Filzi, Baracca, Maddalena, Aro, Oberdan, D’Annunzio, Razza, Mameli, Battisti, Berta, Luigi di Savoia and Gioda.